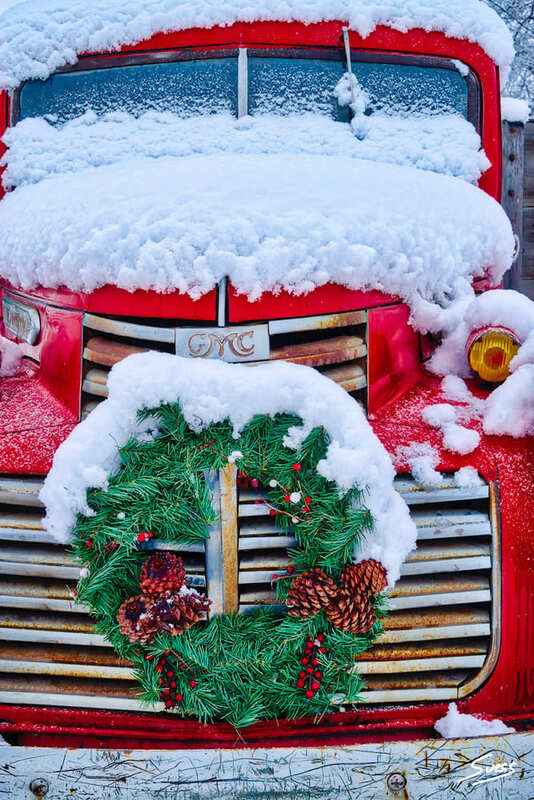 My home in Bozeman, Montana is only a couple houses away from this beautiful old GMC truck and I have been looking for a great photo of it for almost a year and a half. I finally found it while out walking our dog in-between snowstorms. Walking past the truck with fresh snow and a Holiday wreath, I knew now was the time to photograph it. I brought the dog back into the house and grabbed my camera gear. As the evening light was fading and snowflakes were starting to fall again, I spent some time kneeling in the snow with my camera on it’s tripod and found the perfect shot! The year and a half wait was definitely worth it. GMC red pickup truck outside the Coffee Pot Bakery Cafe in Bozeman, MT with a Holiday wreath while snowing.